Dr. Sujatha graduated with her B.Tech in Mechanical Engineering from IIT-Madras in 1992, her MSME from the University of Toledo, USA in 1994, and after a long stint in the prosthetics industry, her PhD from the Ohio State University in 2007. She joined the faculty at IIT-Madras in 2008. 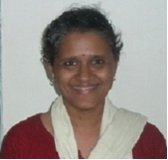 Dr. Sujatha’s work is in the areas of Prosthetics and Orthotics, Biomechanics and Mechanisms. Her Rehabilitation Research and Device Development (R2D2) group focuses on the development of assistive devices and aids for rehabilitation that are biomechanically and economically suited to Indian lifestyles and conditions. Dr. Sujatha’s students have won awards at prestigious national competitions for their projects in assistive devices and her group has also applied for several Indian patents for assistive device designs. She is a co-inventor on several US and international patents for prosthetic designs from her prior work. D. S. Mohan Varma and S. Sujatha, Segmental Contributions to the Ground Reaction Force in the Single Support Phase of Gait. Mechanical Sciences, 5, 37–52, 2014. U. Kumaraswamy, M. S. Shunmugam, and S. Sujatha. A Unified Framework for Tolerance Analysis of Planar and Spatial Mechanisms Using Screw Theory. Mechanism and Machine Theory, 69, 168–184, 2013. S. Srinivasan, E. R. Westervelt, and A. H. Hansen. A Sagittal-Plane Forward Dynamic Model for Asymmetric Gait and its Application to Study Gait of Transtibial Prosthesis Users. ASME Journal of Biomechanical Engineering, 131, 031003 (9 pages), March 2009.